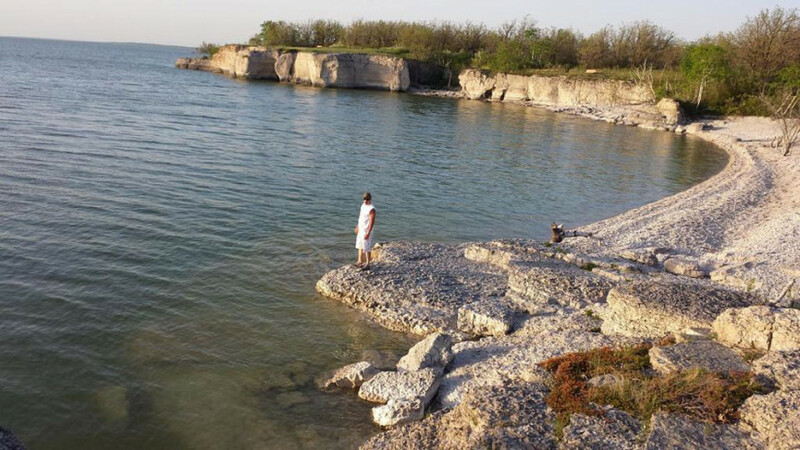 MANITOBA - You'll enjoy the quieter, sandy beaches along this lake, leading to the rocky shoreline at Steep Rock Limestone Cliffs, your weekend destination, a weekend of sunshine, fresh air and lots of water fun, exploring a nature lover’s heaven. Leaving the city limits, take Highway 101 to Highway 6. You're set to explore the only route that takes you to Manitoba's north, following the shoreline of “the other lake”, Lake Manitoba. Heading northwest, you'll see open farmland, great for growing grains and other crops, gradually moving into cattle country. Further north you may even see some bison grazing in roadside fields. You'll note railroad tracks alongside the highway, this is the old CN line, now home to the Prairie Dog Central Railway running to Grosse Isle, the trail head of the Interlake Pioneer Trail. Next community is Warren, you'll find one of the last wooden grain elevators in Manitoba, built in 1948 – a Prairie sentinel rarely seen now. Are you a history buff? Discover the tales of the pioneers from this area at the Woodlands Pioneer Museum. You'll need to plan a day trip later to enjoy all these. The largest Métis settlement in North America is found at St. Laurent, at the south end of Lake Manitoba. From the Manipogo Festival in March to Métis Days in August, life in this community reflects many of the old ways of fishing, language and lifestyle. Be sure to return for one of these celebrations! In Lundar, be sure to stop at the park on the south end of town to snap a selfie with the Lundar goose, a symbol for the thousands of Canada geese found each fall. Come back to stay for a few days at the Lundar provincial campground and take in a few rounds at the Lundar Golf Course or enjoy shopping at the farmers’ markets in the area. Just 15 minutes up the road you'll find Eriksdale, you could stop these coming home, to see the only creamery museum in Manitoba, open seasonally. Perhaps you'll get to try making your own butter! Moving north of Eriksdale you'll pass the west bound portion of Highway 68, leading to the Narrows of Lake Manitoba, Manitou Island and Dauphin. However, that's another trip! Continuing north, do a quick selfie stop at the Sharptail Park in Ashern, capturing yourself with another unique roadside attraction. The scenery here is lower scrubland, and in the distance you see the Interlake's largest flagpole and massive Canadian flag – it's Moosehorn you are pulling into. If you have been lucky enough to find a place to stay at Steep Rock, a stop for a late supper would be great or the Moosehorn Motor Hotel could be your choice for your stay. If you left Winnipeg on a Friday after work you still have time to catch a Steep Rock sunset over the lake... or take this time to relax. Steep Rock town site is just a short drive northwest from Moosehorn, it's best to grab breakfast before you start out. Take Highway 6 to PR 239, turn left and follow the signs. Signage at the outskirts of town shows you the way to parking, I'd suggest you go to the cliffs first, to see them from above, and do some climbing and walking the trail. There are benches where you can relax and enjoy the scenery, or you might prefer to sit on the rock and discover the symbols of past animals etched into the limestone. Wandering along this rocky shoreline check out the multiple coloured rocks, broken down over the years by wave action. Interested in kayaking or paddle boarding? Go find Steep Rock Kayak at the dock area in the townsite, if you didn't bring your own. Drive down to the harbour area, park and talk to Peter; he will fill you in and teach you how to ride a board, or paddle a kayak and you can rent both of these from his place. If it's a calmer day, paddling over to Steep Rock Island is a neat thing to do! Go meet Peter's goats. Swimming is usually done from Steep Rock beach park, the campground you could be staying at. There is a cafe here and a small store with memorabilia and necessary grocery items. 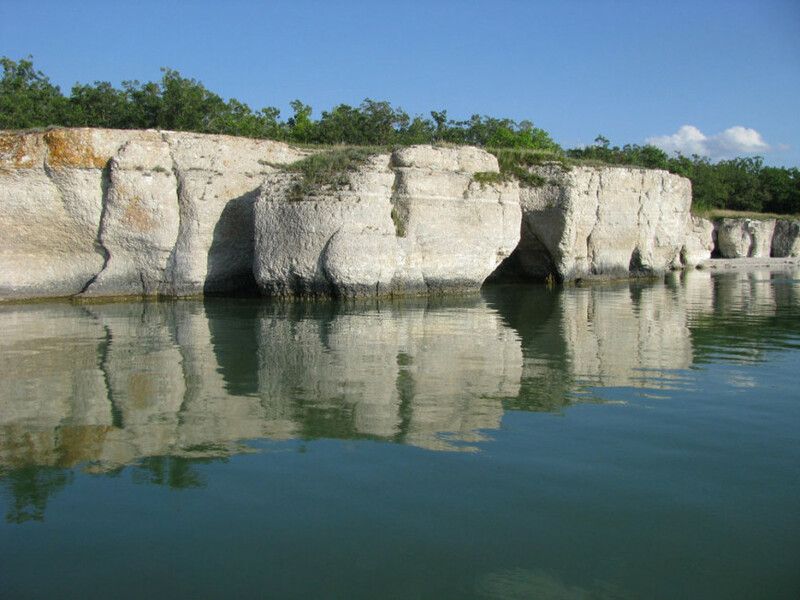 Relax for the day, or continue hiking on the Steep Rock trails, around the quarry, back to the cliffs, and reading all the interpretive signs that speak to the story of the area. You need to include staying for the sunset, as these are spectacular across the western sky, looking out over the lake. If you are lucky enough to know someone that has a boat up here, going for an evening cruise is splendid, with the sun falling and hanging on the horizon to spend those last minutes blazing above the water. Spending two nights here is best, giving you time for relaxation, for reflection and rejuvenation. Make sure that on your way home southbound you leave time to stop at the area’s unique, outdoor museum/art gallery. The Armand Lemiez statue area, south of Moosehorn, has reopened for public viewing. Travelling south you'll be making plans for your next visit this way. By Gail McDonald, the Interlake Tourism manager. www.interlaketourism.com.